I recently taught two of my children how to cross-stitch. It’s something I have enjoyed since I was a little girl, and I wanted to share that with them. 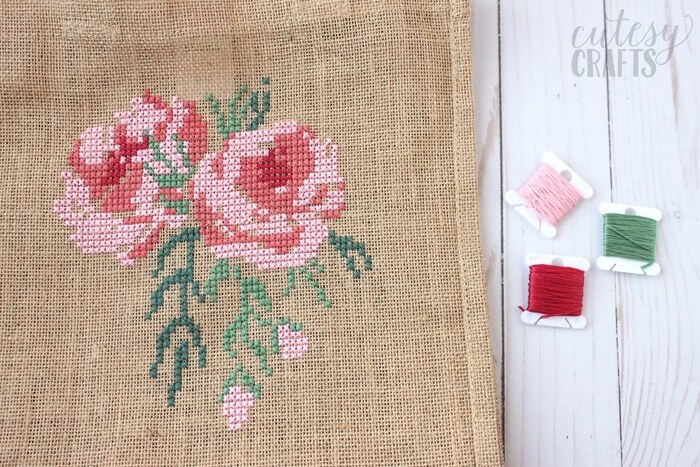 Stitching with them got me hankering to do some cross-stitching of my own, so I created a pretty rose cross stitch pattern. 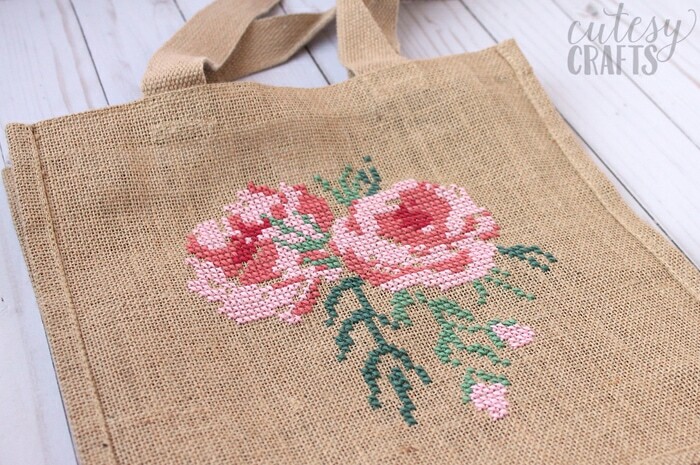 As a fun twist, I decided to try my hand at cross-stitching on a burlap tote bag. 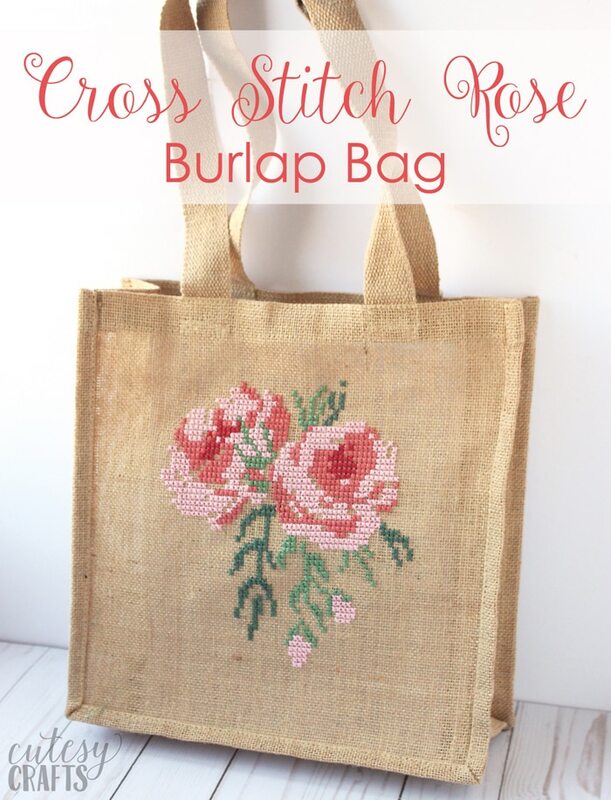 Yes, you can cross-stitch on burlap! 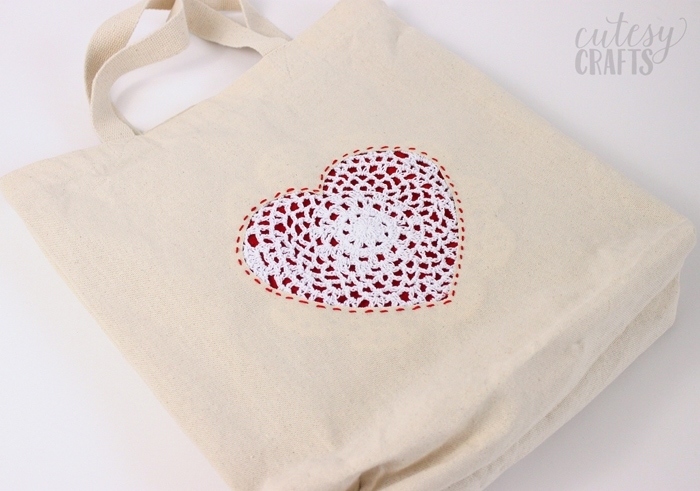 Of course, you don’t have to stitch this pattern on a burlap bag. You can use the pattern for anything you want. 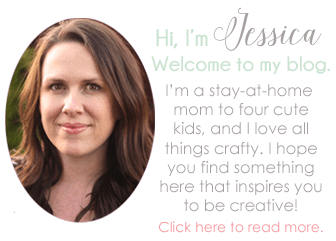 burlap/jute tote bag – This it the one I used. It’s about 12 x 12 inches. fabric protector spray (optional) – I used this one. 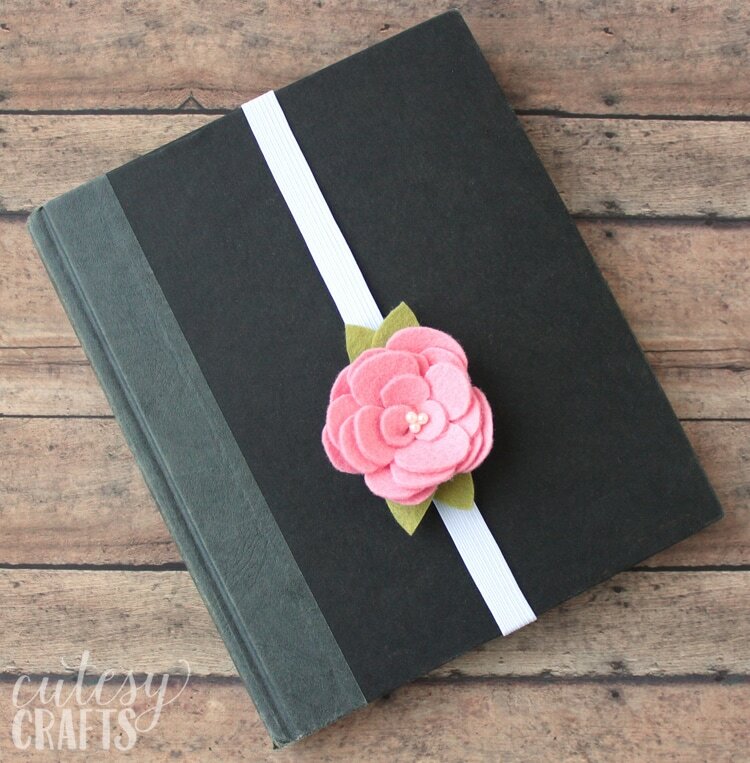 When you print the pattern choose the option “fit” in the settings to make it bigger and easier to see. If you’ve never cross-stitched before, I recommend practicing on some Aida cloth and watching an instructional video first. 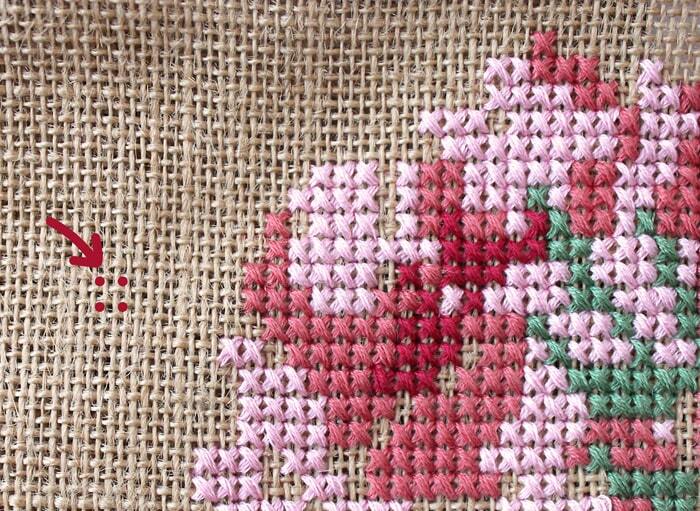 Cross-stitching on burlap is going to be a little more difficult, so you’ll need to know what you’re doing. You have to try a little harder to see the “squares” that you will stitch on. In the photo below, you can see where I marked the four corners that will make each square. It will get easier as you go, I promise! Stitch each row, left to right, making one side of the “X”. Turn around, and then coming back right to left, to finish the other side of the “X”. I tried to keep my hand out of the inside of the bag as much as possible by stitching with my needle like the photo below. Do whatever works best for you though. 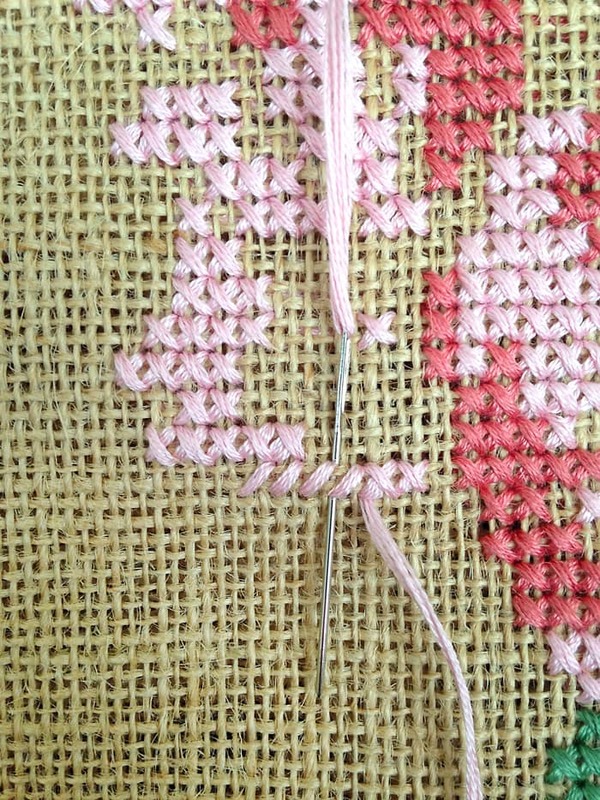 You’ll also want to keep the back of your stitches nice and tidy by stitching over the ends of your threads to secure them. Don’t tie any knots. You will be taking things in and out of the bag, and you don’t want any of your threads to get snagged. When you’re done, it should look like this. If you’re worried about your hard work getting dirty, you might want to spray it with a fabric protector spray. I haven’t thoroughly tested the spray out yet, but I hope it will help keep my new bag clean. I love using my new bag to tote my embroidery projects around when I’m out. It gets compliments all the time! 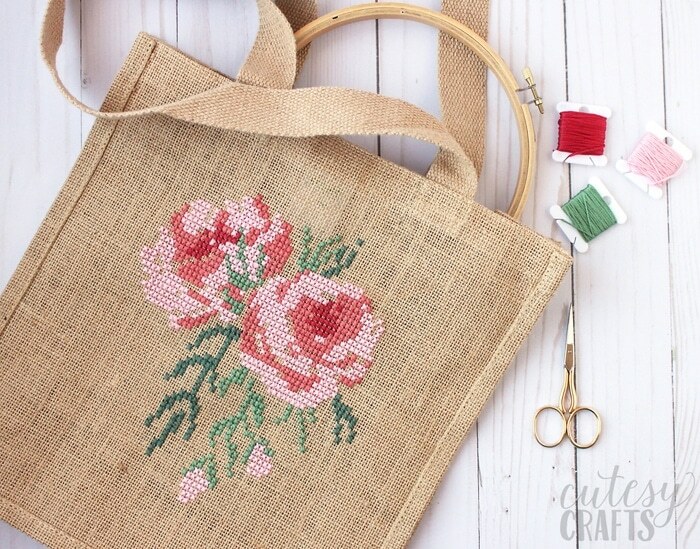 This would make such a wonderful DIY Mother’s Day gift or you can just stitch one up for yourself. 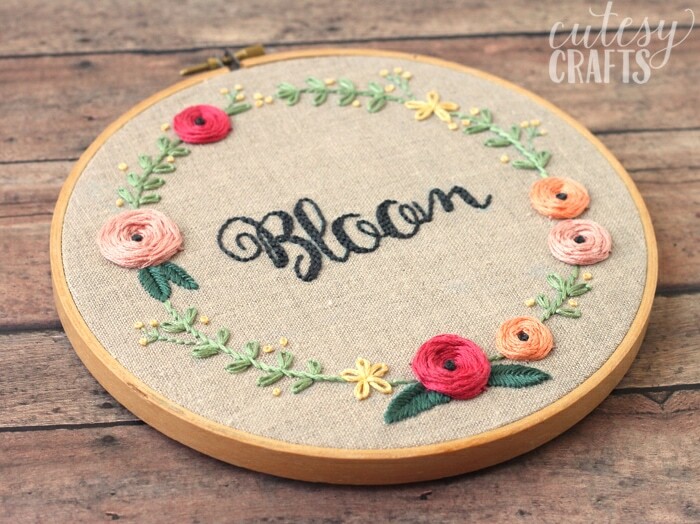 Make sure to check out all of my other hand embroidery designs for more inspiration. To download the free hand embroidery pattern, enter your information in the form below or click here to subscribe to my newsletter. It’s free, and I’ll keep your email address safe. You can also unsubscribe at any time. Also take a look at these other great projects.